What could be considered as the grand finale in the unofficial Plexipave® season kicks off this week in the form of ATP Masters and WTA Premier event, the BNP Paribas Open. 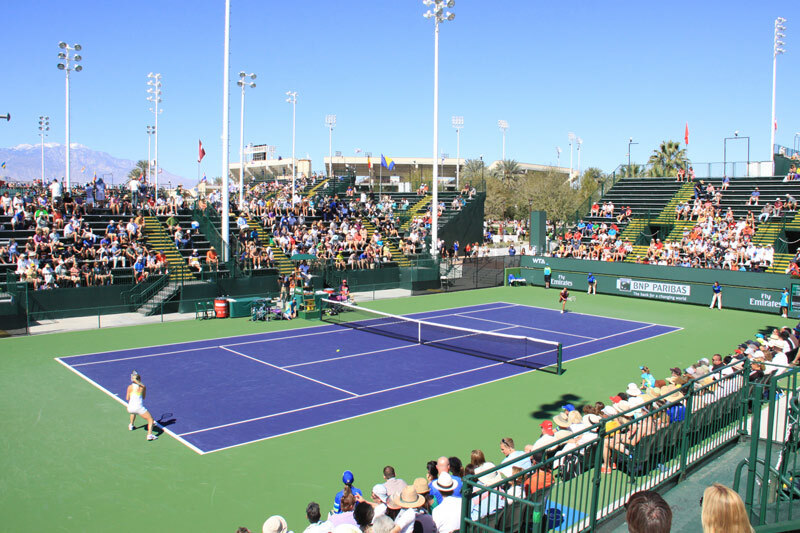 For the 16th year running, the tournament located in Indian Wells, CA chose Plexipave® IW as its surface. Plexipave® IW is a custom surface system that was unique to Indian Wells up until this year. The Mexico Open chose to adapt its surface to act as a lead up event and therefore resurfaced with the Indian Wells’ specialty While the surface may no longer be unique on the tour, the color most certainly is. The Pro Purple interior court color was created specifically for the ATP Masters Series and was first used at Indian Wells. Purple sits exactly 180 degrees across from yellow on the color wheel whereas blue is in the range of 120-160 degrees, giving it the greatest amount of contrast to the ball. Pro Purple makes for an optimal player and spectator experience from a visibility stand point. 2014 brings big change to the best attending tournament outside the Grand Slam. 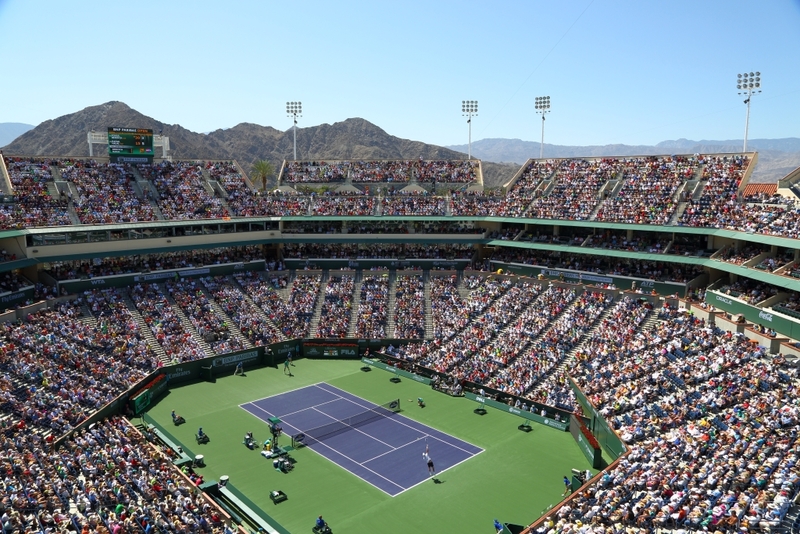 Immediately following the 2013 BNP Paribas Open, Indian Wells began some serious renovations including a brand new stadium court set to accommodate 8,000 and house 3 unique restaurants. In addition, Indian Wells expanded parking areas and seating as well as added a second shaded area for fans. In total there are 29 Plexipave® IW Acrylic courts, 9 show courts and 20 practice courts. Stadium 1 is the largest of the courts seating over 16,000 people. It is the second largest permanent tennis stadium in the world behind Arthur Ashe at Flushing Meadows. Plexipave® authorized applicators, Zaino Tennis Courts, annually resurfaces the courts at Indian Wells to prepare them for the tournament. In addition to the resurfacing, this year Zaino had new Plexipave® IW surfacing projects in Stadium 2 and 4 new practice courts. The Plexipave® IW system was created specifically for the dry, high altitude conditions found in the Coachella Valley. This year’s tournament draws in a competitive field both on the Men’s and Women’s side. Serena Williams was rumored to break her 12 year absence from the tournament but withdrew in mid February. The remaining top 10 women will all be in attendance in addition to Mexico Open Champ, Dominika Cibulkova. The entire ATP top 10 have also entered the tournament in addition to Mexico Open Champ, Grigor Dimitrov. First round, main draw action begins Wednesday for the WTA and Thursday for the ATP. 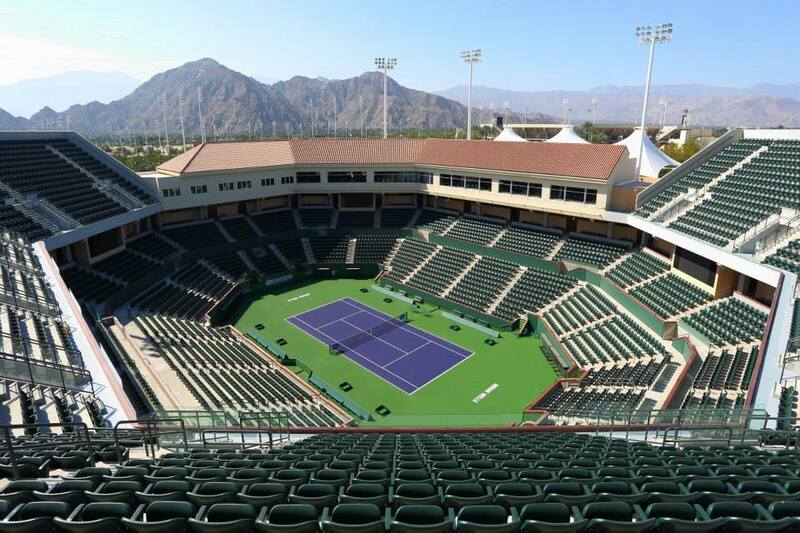 If no Davis or Fed Cup Ties are played on Plexipave®, then the BNP Paribas Open is the final event on the surface until the Emirates U.S. Open Series kicks off at Stanford in July! It’s been a great start to the 2014 season especially with Acapulco joining the Plexipave® family of tournaments. I hope you all have enjoyed it as much as we have. Now we leave you with this superb construction time-lapse of Stadium 2. Until summer! This entry was posted in California Sports Surfaces, Plexipave® and tagged Acrylic Surface, BNP Paribas, BNP Paribas Open, California Sports Surfaces, Indian Wells, Indian Wells Masters, Indian Wells Tennis, Indian Wells Tennis Garden, PlexiPave, Plexipave IW, sports surfaces, Stadium 2, Zaino Tennis Courts.